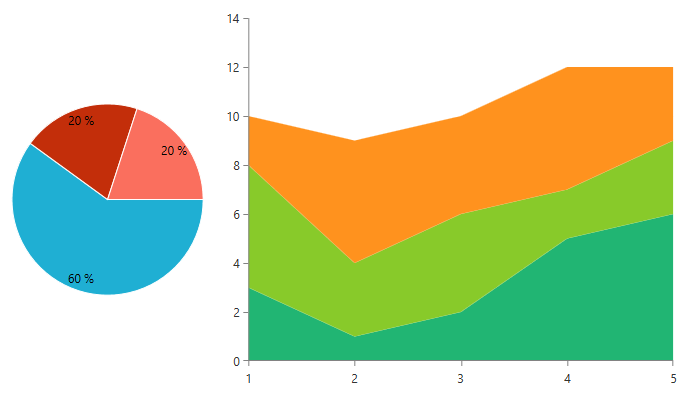 Here you can learn how you can create your own chart palette. Notice the SeriesFamily property, which is available for the collections in the SeriesEntries. If we have this palette in a chart, the first collection will be used for the pie series, the second - for the bar series and for all other types of series - the GlobalEntries collection. Note that defining GlobalEntries or SeriesEntries is not mandatory - you can use either one of the two or you can combine them as in the current example. In the above example there two charts - a Pie chart and a Cartesian chart. The PieSeries of the Pie chart are using the colors from the PaletteEntryCollection with SeriesFamily set to "Pie". Since we did not set a specific PaletteEntryCollection for the area series of the second chart, they use the colors from the GlobalEntries collection.